Few things more relaxing than an evening spent on a porch or patio swing, conversing with loved ones and watching the sun go down. Figuring which to purchase from the hundreds of options out there will depend on the style of your home, budget, personal taste and the logistical aspects of the space where you want to put the swing. 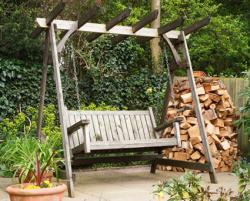 A straightforward wood swing is the image that first pops into mind when thinking of a patio swing. These are usually the least expensive options and are a great fit with any traditional style home - especially those with wood siding. 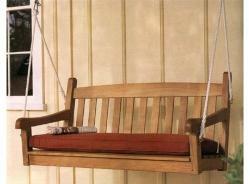 HOS-HardwareOnlineStore.com offers a basic five foot wide fir swing that needs to be hung from a porch rafter, tree limb or other sturdy structure. The advantage of this one is that it comes in raw wood, allowing you to choose the color of paint or stain that will best match your house. Retailing for under $80, it is an easy, functional swing at a budget price. If you're in the market for something a little more refined, Amazon has a gorgeous teak swing for around $300 that will elevate the ambiance of any patio area with its simple elegance. It comes with the seat cushion. If you don't want to bother with figuring out what to hang your swing from, Wayfair has a simple pine swing that comes with a matching wooden stand. It also comes weatherized with a clear lacquer finish that allows the natural wood grain to shine through and is available online for around $160. 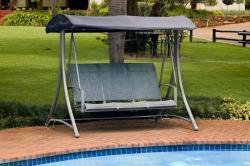 All canopy swings are free-standing, meaning they don't need anything to hang from. They come with built-in shade, making them a great choice for a sunny patio or poolside area. 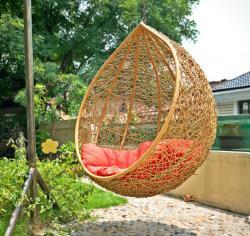 Virtually all canopy swings have plush seating unlike the the hard wooden models. Overall, they have a more modern look and are a good choice for homes with stucco or vinyl siding. 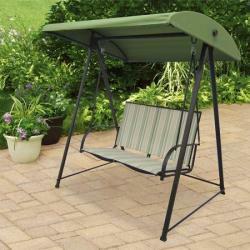 For a truly extravagant patio swing, check out the gazebo swing from Outsunny at Walmart. It's pricey at $450, but you will feel like a sultan under the extra wide the four-post canopy complete with a wrap-around mosquito/shade screen to protect you. It also folds down into a daybed and the powder coated steel frame and polyester cushions and canopy are built to hold up to the elements for many years. Amazon has a very simple but functional economy model for around $360 that seats two people. The stand is made of powder-coated steel tubes and the solid canopy and striped ventilated seat are UV-treated and fade-resistant in green shades that will match any landscape. Check your local store for availability. Hayneedle has a really good-looking canopy swing for $230, featuring a steel-tube frame and a five foot wide seat that actually folds down to make a swinging bed. The capuccino color would go great in any landscape. Beyond these two general categories of patio swings there are an incredible array of unique and artistically-designed swings out there that defy categorization. A few to fantasize about include the following. For $20 Walmart has a unique twist on the patio swing concept - it's a one-seater hanging chair made of cotton rope. It's light and airy looking and easy to attach to any low-hanging tree branch, but it's one disadvantage is that it's not very weatherproof. Fortunately, however, it's collapsible and weighs about three pounds, so bringing it in is a breeze. Wayfair has a really unique single-seater swing with its own built in umbrella. 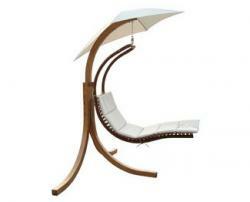 It has a curved three-legged stand to support the umbrella and the reclined patio chair that hangs in its shade. It's $360 but is built with top-notch materials and sports a classy designer aesthetic. Lowe's sells an egg-shaped single-seater swing that is perfect for burying oneself in on warm spring, summer, and fall days. It's made of wicker, comes with a cushion, and costs around $600. It also comes with its own stand and hanger, so you aren't limited with placement options. Whether you're looking for an old-fashioned wooden slat swing for your patio or something a bit more exotic, there's a style out there to suit you and your budget. 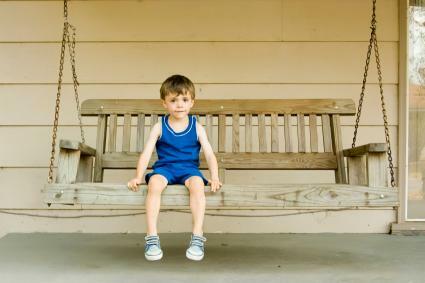 A patio swing is a simple way to invest in your quality of life - just don't forget to get outside and enjoy it.